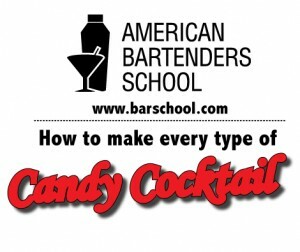 Learn how to make hundreds of popular mixed drink recipes at American Bartenders School. Read the reviews posted online by our students and call to become a bartender today! These cocktail drink recipes are the same that our students learn in our bartending schools. Each cocktail drink recipe blends the right amount of liquor and mix to make a great tasting cocktail drink. We have included easy to follow instructions to help you expertly prepare your favorite drinks and cocktails. These drink and cocktail recipes are the ones most frequently requested. The major difference between our recipes and most of the other drink and cocktail recipes on the web is that these drinks will taste good. Many recipes on the internet are posted by amateurs who have never worked as bartenders, and have no knowledge of the art of mixology. The American Bartenders Schools are the oldest and largest chain of bartending schools in the nation. We have helped over 100,000 people to become bartenders over the last 34 years. We have graduates working as bartenders in all 50 states and 47 foreign countries worldwide.